A few months back we talked about the effort Philips POV took to make a real football sim releasing NFL Hall of Fame Football on CD-i in 1995. Fewer people (especially in Europe) know about the two trivia NFL games that were produced in 1994 and 1995 by CapDisc. A little bit in the way how we got Jeopardy running on CD-i, CapDisc tried their own with the NFL license. Which one to take, you ask? 'Instant Replay' gives you a chance to make the call on a database of 300 plays captured in digital video by NFL Films. Was that a flagrant face-mask penalty (15 yards), an incidental (5 yards) or no foul? Did the runner have possession of the ball before he fumbled it, and who gets the ball as a result? It probably doesn't speak well for the sport of football that its rules are so confusing, but it does make for an interesting diversion. The layout and design of the game are nice -- game rules are explained by an onscreen ref, the plays are narrated by NFL broadcast stalwart Pat Summerall, and you can ask for an explanation of calls after the correct answer has been revealed. In many ways, the game resembles CapDisc's earlier NFL Football Trivia Challenge discs, and that comparison holds true for its biggest flaw: like its predecessor, it makes no effort to reduce repetition of questions. Getting questions you've already seen is a big bummer, especially in situations where the game's owner is given an unfair advantage over a guest by having seen many of the questions before. The problem is more acute here, because the huge data and research demands of asking questions via archival films makes for a small database. 300 questions, in fact. If the game used the CD-i player's memory to log the usage of questions, as do the CD-i game shows Jeopardy and The Joker's Wild, you should be able to get through about 13 - 15 games without repeat questions. But in my third game, about a fifth of the questions were repeats. This raises serious long-term playability concerns. In fact, it's kind of bizarre, since the game updates its entry in the player memory after every game, even if you don't get on the high score list. NFL Instant Replay is an impressive title, one CD-i football fans will want to show off to their friends, but in terms of game-play and value to the customer, CapDisc did better with the NFL Trivia disc. In 'Trivia Challenge', you and an opponent answer questions to gain yardage and march the ball downfield in hopes of making a touchdown or a field goal. The faster you answer a question, the more yardage you'll pick up if you're correct. Unlike other CD-i game-shows like Joker's Wild and Jeopardy, the game doesn't use the machine's storage to mark which questions have already been used. On the plus side, the gameplay is remarkably fast and furious for a trivia title. Since yardage is earned by answering fast, you'll want to quickly scan a question, hit the question-mark icon, and immediately pick out an answer. The production values on the title are sumptious. The game is hosted by the voices of CBS football broadcasters Pat Summerall and Tom Brookshier, who offer help and make appropriate commentary about your play throughout the game. And yes, they use that all-time classic cliche about failed field-goals, ''that could come back to haunt them.'' 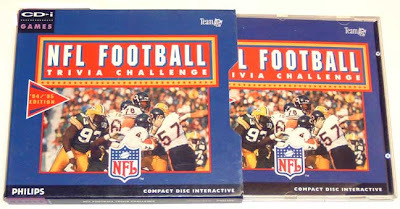 Cut to the chase: NFL Instant Replay uses Digital Video which I love on CD-i, Trivia Challenge is a base-case title. But the presentation of the first one is clearly better and faster. I'd prefer the first one.